What better day to share this easy, cheap and yummy program idea than National Ice Cream Day?? This is a fun "Kitchen Chemistry" experiment that just has a few easy to obtain ingredients and supplies, is easy enough for the little ones, but will appeal to older kids as well. What's better than a chemistry experiment you can eat?? And yes, it really works! 1. Add 1/2 Cup half & half, 1 Tablespoon sugar, and 1/4 teaspoon vanilla extract to small zip-lock bag and seal. Shake to dissolve sugar. 2. Fill gallon zip-lock bag about 1/2 full with ice (check and record the starting temperature of the ice) and add 6 Tablespoons salt and shake to evenly distribute. 3. 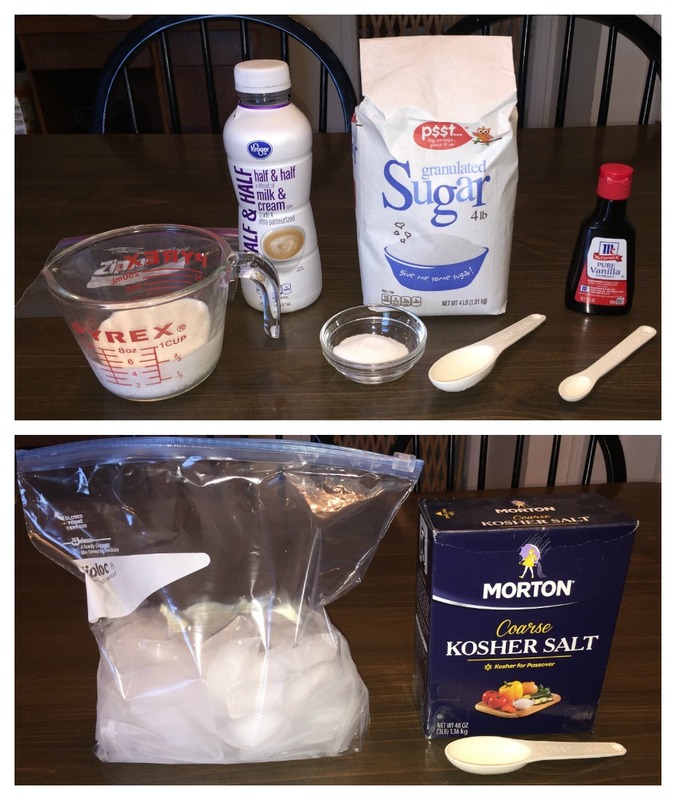 Place smaller, sealed bag containing cream mixture inside the larger bag containing the ice and salt mixture, add a little more ice and seal. Shake entire bag and contents for 5-10 minutes (5 is usually enough for soft ice cream). This gets very cold, so it is recommended to either wear warm gloves, or wrap the bag in a towel (a towel will also help insulate and keep it cold). 4. After 5-10 minutes, ice cream should be ready! Carefully remove inner bag containing ice cream. Check and record the final temperature of the ice/salt/water mixture. You may be surprised by how much it dropped! 5. Ice cream will be creamier if you quickly but gently squish it around a little bit in the bag. Not too much though, or it will melt! You can add desired mix-ins, such as chocolate chips, cookies pieces, etc. at this point as well. Ice cream may be eaten directly out of the bag, or spooned into a dish, and garnished as desired. It will begin to melt immediately, so dig in! 6. An alternative to ice cream is to make sorbet from fruit juice. Juice can be used straight out of the bottle, but I like to dilute it slightly with a little water and add a teaspoon of sugar, as it seems to taste less sweet when frozen. This is a great option if dairy allergies or lactose intolerance are an issue. I have not tried non-dairy milks, such as soy or almond, but I would imagine they would be more icy and not creamy. Sorbet made with cran-raspberry juice. So, how does this work? The chemistry of this is a little tricky to explain, but it has to do with phase-changing and the lowering of the freezing point of water by the dissolved salt. The ice begins to melt, providing just enough liquid water to start dissolving the salt. The dissolved solute depresses the freezing point of the solution, allowing the temperature to continue to drop rather than remain a constant 0 degrees Celsius. The temperature drops because the remaining ice absorbs some of the energy (in the form of heat) from the salt water as it continues to melt (an endothermic reaction) . You can explain the chemistry either in the beginning, during the shaking time, or after. 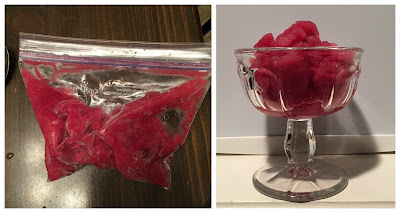 This experiment does not take very long, so you could do ice cream first, and have time to try making sorbet (those who already made sorbet due to dairy issues could try a different flavor), or combine it with other simple "kitchen chemistry" experiments. A couple of good ones to pair with this would be the old picking up an ice cube with a string trick, and making butter from heavy cream in a jar (or small plastic container). For a library program, display books for check-out with other simple at-home science experiments, fiction or non-fiction books featuring or mentioning ice cream or the dairy industry, and cook books (especially any explaining the science of cooking).